Standard shipping and handling rates apply, unless otherwise arranged: $13.00 for first book and only $2.00 each additional. This savings may be combined with any other offers. Please note these books are drop shipped directly from the author. Publish 10 books, pay 9 for color and 1 color book black and white cost. Publish 100-109 books, get 10 color books at black and white cost. Publish 210-219 books, get 21 color books for black and white. Specifically request this offer with your order/payment mailing. Send your manuscript, mailing information, and payment to arrive at the publisher before August 31, 2015. Copy of sale header must be sent with mailed order (PayPal should request Riley sale order billing billing with this link). Dee p discounts over our soft cover publishing packages – until mid-April only. Visit the website for further details. 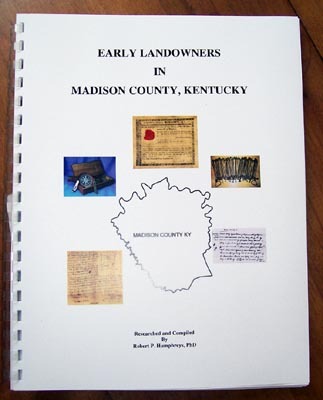 Early Landowners in Madison County, Kentucky, by Robert P. Humphre ys, PhD, 2014. 8½x11″, softbound book, ISBN 978-1-936091-30-3, 94 pages, includes CD with custom maps: 13 quad maps dealing with this content. If order is postmarked before March 2nd, discount price is only $20.00 with s&h ($12 Priority for first and $2 each additional). Retail price (order # R3815) for soft cover is $25.00. Special order POD hardbound is also available. The objective of this work was to identify any and all of the early land patents that were located (partially or completely) within present-day Madison County, Kentucky and to prepare an alphabetical index of these patents arranged by the name of each grantee. The patent database from which the Madison County patents were to be identified was the Virginia Series and Old Kentucky Series of patents for the State of Kentucky that are housed at the Kentucky Secretary of State Land Office in Frankfort, Kentucky. Confirmation that a patent was located within Madison County (completely or partially) was to be established by creating a series of maps depicting the approximate location of each patent within the county. Early Landowners in Madison County, Kentucky, by Robert P. Humphreys, PhD, 2014. 8½x11″, softbound book, 94 pages, includes CD with custom maps: 13 quad maps dealing with this content. If ordered postmarked before March 2nd, discount price is only $20.00 with s&h. Retail price (order # R3815) is $25.00. Special order POD hardbound also available. Order by mail at PO BOX 505, Wyandotte, OK 74370. Standard S&H $12.00 first item, $2.00 each additional to same address. Let us help you make the decision to go into hard cover a bit easier, we’d like to offer an additional $1.00 off our list price for publishing color hard cover books: This is good in any quantity. To qualify for this special offer, you must do the following: Specifically request this offer with your manuscript/deposit mailing. Send your manuscript, mailing information, and deposit to arrive at the publisher postmarked no later than 1-15-15. Include a copy of this post, or the top of our sales offer webpage.